Here I am in my grandmother's village, a place I keep secret to preserve it's special-ness and keep people from finding me. We are in the midst of the worst heat-wave in 100 years, alternating between the air-conditioned room and the sea which is still miraculously cool. Well it is not entirely true that this is all we do, because every morning Dorian and I drive to the town of Molaos to get the papers we need to restore my grandmother's house, now a complete ruin after decades of neglect. It's over an hour's drive to this small agricultural town and we leave early in the morning to avoid the heat. But as each day passes the heat gets harder to avoid and it seems that the nights are just as hot as the day and running around a regional capital going from office to office to get papers signed and stamped is no way to spend a holiday. So when Saturday comes around I want nothing more than to wake up in my air-conditioned room and jump into the cool sea and stay there until my body temperature gets so low that 110 degrees seems like a mere 99 and I can at least make it back to the room without heat stroke. But Andrea has other ideas. She has been trapped in the village doing exactly what I want to do, for the last week, going back and forth between the sea and the air-conditioning and she wants out in the worst way. Despite the simple beauty of the village and the fun of playing chaperone and parent to a teenage girl and a seven year old who thinks she is a teenager, Andrea is going a little bit stir-crazy and demands an adventure to break the monotony. Today is the hottest day yet, the hottest day of the year and maybe the hottest day of the century and what does she want to do? Go for a drive. Where? Monemvasia. The hottest place in the Peloponessos. I am not a coward and I can stand up to anyone. Except Andrea. I would rather roast in hell than have her mad at me for the entire day in a confined space the size of our air-conditioned room. So we set out on our little journey, and to make it more interesting we take our guests Dorian, who has been helping me with the paperwork for the house, and his daughter Holly, a beautiful teenager who loves to torture her father by using up the pre-paid calling card by talking to her friends in Athens on his cell-phone he has left her for emergencies only. With 5 of us squeezed into the little rental car and the temperature outside in the hundreds and rising, this promises to be a fun-filled day. Driving through the mountains of the Peloponessos is almost like watching a documentary of the moon. It is a stark beauty that someone like myself or Andrea can appreciate in the way a Bedouin can appreciate the beauty of the desert. But for a kid it is just plain boring and my daughter Amarandi and her new pal Holly begin a never ending chorus of "Are we there yets?" and "How much longers?" that are virtually uninterrupted except during a few roadblocks set up by goats, until we reach the town of Geraka, home of the mythological Kojak. Yes our first stop on this scenic tour of Laconia is the hometown of Telly Savalas. Geraka sits on a big salt water marsh and lake at the end of a narrow passageway from the sea. It is really a beautiful place though occasionally the guy who is supposed to pick up the plastic bottles and bags goes on vacation and forgets to inform his apprentice. 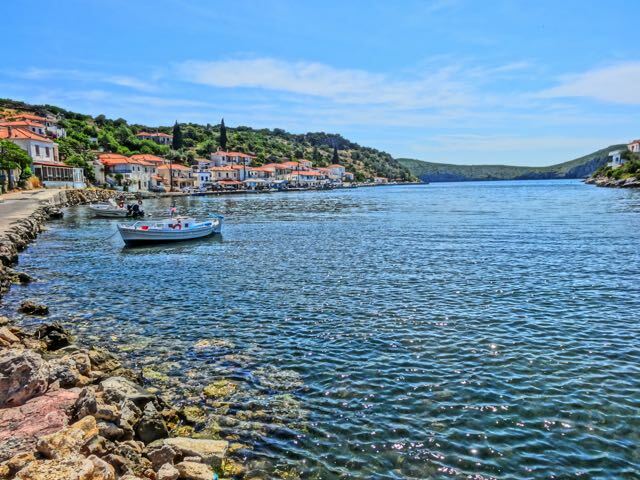 But because it is probably the most sheltered little harbor in Greece it is a very popular place for yachts and sailboats who can spend the night here and not worry about the changing winds or rough seas. Because of this the port area has several very nice little restaurants, cafes and ouzeries. Being a completely closed harbor it is not the best place for swimming as there does not seem to be any real beach, but people swim off the rocks in the channel. Today, it is so hot there are few people here. The yachts that have spent the night have moved further north or south and the only other people in sight besides a couple fishermen mending their nets are a Canadian couple. We talk to the man whose name is Peri, a filmmaker who has a family home in Monemvasia and dreams of exporting his olive-oil to America to finance a film about kamakis (Casanova's) in Greece using the medieval town on the rock of his ancestral home as his set. We eat a bowl of fresh homemade yogurt with local honey and sit in the shade trying not to move too much. It is really not unpleasant but the girls are restless and bored and Holly hates yogurt and wants to survive on chocolate cookies and ice-cream. Amarandi is sensing that if she declares she no longer likes yogurt then she too will be able to exist on chocolate cookies and ice-cream, and unfortunately there is a grocery store that sells yachting supplies, canned spam, chocolate cookies and ice-cream. We accept that we have lost our daughter and she will no longer be satisfied by the simple purity of the Mediterranean diet and send them off to buy whatever they want so we adults can have a few moments of serious conversation. "They told me in my grandmother's village that Telly Savalas came back here to Geraka to film a documentary of his life. They said the villagers here were insulted because he would come into the cafeneon and sit by himself and not talk to anyone or buy anyone coffee or drinks. Then he decided he did not like the way the village looked and went off and filmed it somewhere else, like Kosmas." "This sounds like village talk" says Andrea. "Why wouldn't Telly Savalas want to film in this village? It is his ancestral village, it is beautiful and it is interesting and it has the lagoon." "Maybe Telly thought Geraka does not fit the public's image of a Greek village. I mean how many Greek coastal villages have a lake? Maybe every time they wanted to film the harbor was filled with yachts. How can you make a film about a guy's humble beginnings in a town with a harbor full of yachts? And maybe he didn't buy the old guys in the cafeneon a drink, but he may have been shy. 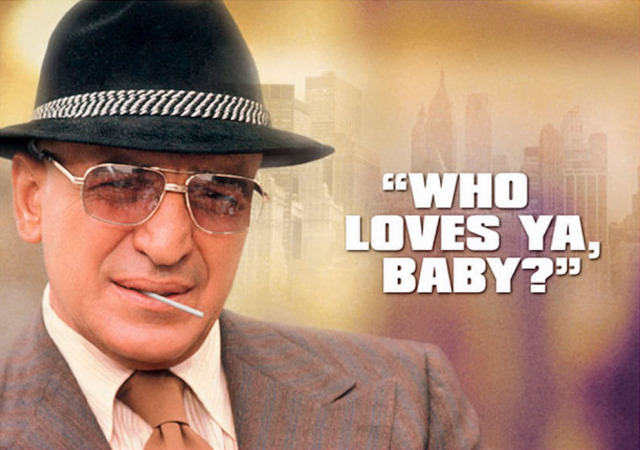 Sure Kojak would have bought drinks for everyone and kept them entertained with cop stories. But Telly Savalas was an actor and they can be insulated and insecure just like real human beings. The villagers should have bought him a drink. It's their turf. Despite his ancestry he was still a guest." The conversation continued along these lines until Dorian came up with the most obvious answer. "Maybe they didn't trust him because he was a cop." It was amazing that none of us had thought of this. Of course, a remote village that probably did not even have a policeman of its own, and who comes to town but the world's most well known cop. Each old man was probably wondering if this was his day of reckoning for some minor offense he had committed against his neighbor or a family member. A finger on the scale at the olive co-op or a foot or two shaved off a property boundary or even a tab unpaid at a now defunct store. Kojak's presence in the cafeneon probably make everyone in town feel the way I do when I see a state trooper in my rear view window even if I am driving under the speed limit. It was too hot in Geraka to do anything but sit and talk about Kojak so we said good bye to Peri and got back into the car and drove south along the coast. We passed several interesting beaches and a small harbor with a sunken tug boat and some villa type houses being built that looked as out of place as wooden shoes on an antelope. But we stopped and I got out and took some pictures while the others huddled inside the car their skin sucking up every last cubic inch of air-conditioned air. Finally around a curve in the road the giant rock and the citadel of Monemvasia appears and within a few minutes we are driving through the modern city on the mainland, which is separated from it by the narrow causeway and bridge. I park the car and we all set out in different directions, each with a purpose and only vague plans of where and when to meet again, we were so disoriented by the heat and the close company in the car. I had the most important task. I was to find the store that sold foreign newspapers. There was a small tourist shop that had the racks that said Herald Tribune and foreign press but it was filled with Greek magazines. Inside the man told me that all the foreign papers were now sold at the Supermarket. I thought maybe he had misunderstood me but I followed his vague directions and ended up walking about a mile up the road before realizing I had made some kind of mistake or miscalculation. But I used the opportunity to visit a couple of the hotels and take some pictures and meet the owners, before heading back through the city streets and the 110 degree heat to begin my search again. There were few people on the street and I was walking at a pace more suited to a wintry day in Manhattan, but with sweat poring out of every gland. I started from scratch and this time swallowed my pride and asked several people along the way and eventually found the Supermarket and the newspapers. I bought the International Herald Tribune and the Athens News and went back to find the others. Of course there was nobody around and rather then wait I took the opportunity to wander around the modern town while it was still relatively early in the day and not as hot as it was going to be, the thermometer at the first restaurant in the port reading a mere 112. Again I rushed from point to point like a fanatic looking for the best shots and angles while the people in the cafes drinking their frappes in the shade wondered what kind of a nut would be running around taking pictures today. How could they know the sense of duty I felt that made me practically oblivious to the terrible heat that had turned them all into mental cripples, unable to move from their chairs for anything less then using the toilet. Miraculously we all converged on the car at the same time. The others however had been back to the car several times looking for me and it did not seem like such a miracle to them. They were drenched in sweat and unhappy and wanted to go to the beach. Luckily I had seen a nice beach in my travels and after stopping at an excellent little dive shop to buy a new mask and flippers for Amarandi, we drove through the town to where the cool blue Aegean met the hot white shore. We found a little bit of shade under a small tree and took off our shoes and clothes and ran to the water scorching our feet on the hot sand and stones. The relief was extraordinary but rather then make the most of it and spend the time enjoying it we began to torture ourselves wondering how we were going to get from the sea back to our clothes and shoes. My feet were already scalded and practically useless and I knew the others felt the same. We would have to pick someone to make the supreme sacrifice and run back to get our shoes, like Jim Brown in the Dirty Dozen. But looking at my crew of unhappy travelers I was forced to admit there was nobody with the courage of Jim Brown with the exception of myself and I didn't want to do it. I would just assume stay in the water until the sun went down and take my chances then. Luckily our old friend Peri the Canadian olive-exporting filmmaker showed up and got our shoes and we swam around working up script ideas for the film. After awhile, though our bodies were submerged in the cool sea the tops of our heads were absorbing an awful lot of heat and I had the feeling that brain damage was eminent, so we gathered our things and jumped into the car which was so hot that I scalded my hands on the steering wheel and had to drive with a wet towel. We drove back to the port to the Aktaion Restaurant and sat inside where it was only about 100. Peri joined us and we had a delicious meal of fish and salads, with Holly and Dorian eating a big plate of giovetsi. How anyone can eat meat when it is this hot is beyond me. In fact I felt like the only reason we were eating was to have an excuse to be out of the sun. When the thermometer outside is reading 115 degrees, the last thing on my mind is how hungry I am. But surprisingly despite the fact that the effort of chewing and swallowing made me sweat as much as doing a workout at Gold's Gym, I came to the realization that eating during a heat wave has the same effect as eating while you have the flu. You forget how much you are suffering, as long as the food holds out. My plan called for us to drive to the entrance of the citadel and wander through the village and take pictures for my website, like any good travel writer in my position would do. But nobody else wanted to do this. Everyone wanted to go home to the village and the air-conditioned rooms. We decided upon a compromise. There was a flying dolphin waiting at the dock on the causeway that would be stopping at our village on the way home. Dorian could take the girls and Andrea and I could continue our exploration of the rock. But Andrea was not enthused about walking through the village with the sun beating down on us either so we came up with yet another plan. We would all go home but while Dorian and the girls took the Dolphin, Andrea and I could drive back at a nice leisurely pace and enjoy the scenery without a car full of complainers. So we drove to the ticket office and purchased tickets for the dolphin and then since we had half an hour we drove to the entrance of the citadel just to see it. I had actually been here 30 years before with my parents, before Monemvasia had hotels, tourists or the Germans who had bought up all the ruins and turned them into beautiful summer houses. The history of the village is a rich one and the fortress which has been used and added to by everyone from the Byzantines, the Crusaders, the Venetians and The Turks, is one of the most spectacular sites in the Aegean and has been called the Gibralter of the East Mediterranean. There is a book available at the tourist shops called Monemvasia: The Town and It's History that will give you an appreciation of it's history. But to appreciate the dramatic beauty of the site one only has to visit the town and walk through the stone streets. But not when it is 120 degrees. We dropped the others off at the Dolphin and waved goodbye as it left the dock, gathered up speed, rose up and left the bay. Andrea and I were then able to drive back to our village and except to take a couple pictures of the lake at Geraka we didn't even get out of the car. The fact that there were only two people in the vehicle soaking up the cool air made it much more pleasant than the journey to Monemvasia and if I had to drive another ten hours I would not have minded. We got back to the village at sunset and went for a quick swim and then sat in the room until dinner. It was too hot to even have an ouzo but a cold beer tasted pretty good. Even Dorian, a recovered alcoholic who had not had a drink in 2 years had one. The heat wave lasted 2 weeks. We survived it but it did not break until the day we had to leave the village to catch the ferry to Lesvos. It had begun the day we arrived in the village so in a way it was not as if we were on a vacation. We were just in a place where surviving was less challenging than say, being in Athens, which according to my friends who were stuck there, was absolutely awful. But they don't have AC and can't escape the heat. I guess the point of this story is that Monemvasia is indeed a beautiful and interesting place to go. But if you go in July or August you will want a room with air-conditioning and a view. The chances are slim that it will get as hot as it did the summer of 2000 and for as long a period of time, but it is better to be prepared than sorry. This is probably what you were looking for when you found this page but I put it at the bottom so you would have to read my story. 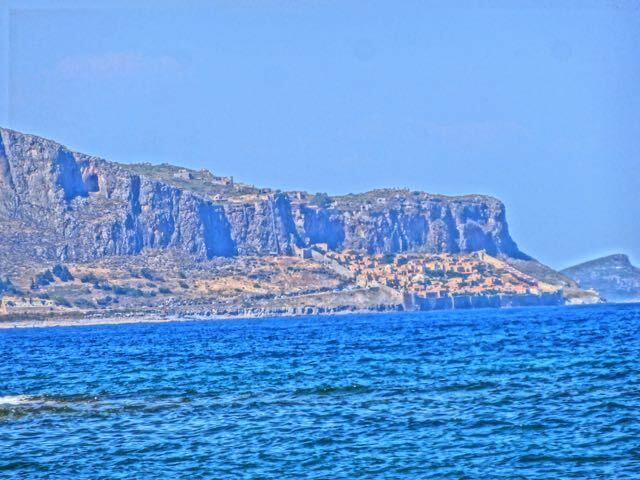 I have been to Monemvasia several times since I wrote it and so I actually have more information to share than how hot it was. When you arrive in Monemvasia by car you can find the walled fortress town by crossing the causeway and following the road to the gate. From there park your car wherever you can (not so easy in the summer but people come and go so if you wait a space will open up), and enter through the gate. It is pretty much one main shopping street with some nice cafes and restaurants, all on the fancy side of Greek tourism, but not really expensive. I suggest wandering around the city until you get hot or bored and then come back to one of the cafes and figure out what to do next. There are some tourist shops and some traditional products shops and the Malvasia wine from Monemvasia is great and hard to find outside of the area. You can visit the Monemvasia Winery in nearby Velies but you should probably contact them first to make sure there are tours. If you want my opinion on the best thing to bring back from Monemvasia as a gift or for yourself, go to the Malva Gallery right by the entrance of the town and get a print by Manolis Gregoreas. His artwork is beautiful and inexpensive and he will mail it home for you. There is a network of footpaths around Monemvasia with trails signposted so if you are a walker you will be very happy here. Find a copy of Laconia's Traveler, a free newspaper put out by the region, which has maps and lots of information. For those staying in the fortress you can swim in this nice area of flat stones about a five minute walk towards the modern town. There are probably some other spots below the city that you can ask about at your hotel. There are several beaches within walking distance of the modern town, mostly stone but not too bad. A couple miles north of the town is Pori beach which is long, sandy, beautiful, clean, with shade trees and wide open sea. 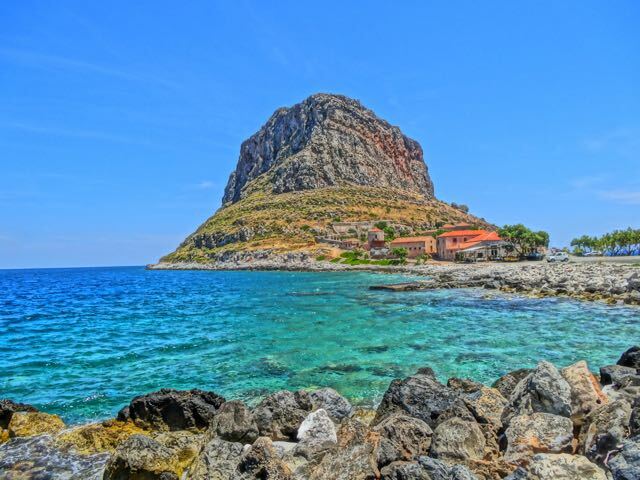 It has a great view of the rock of Monemvasia. 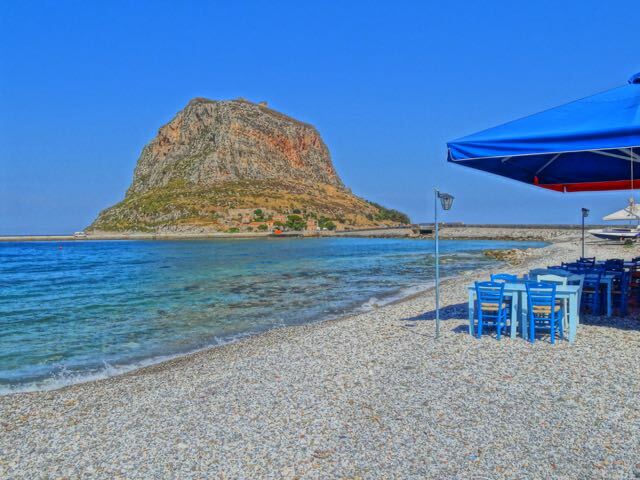 South of Monemvasia there are four smaller beaches that are very nice, called Xifias (the one in the photo), Ampelakia, Livadia and Agios Fokas which are all reachable by car or bicycle. 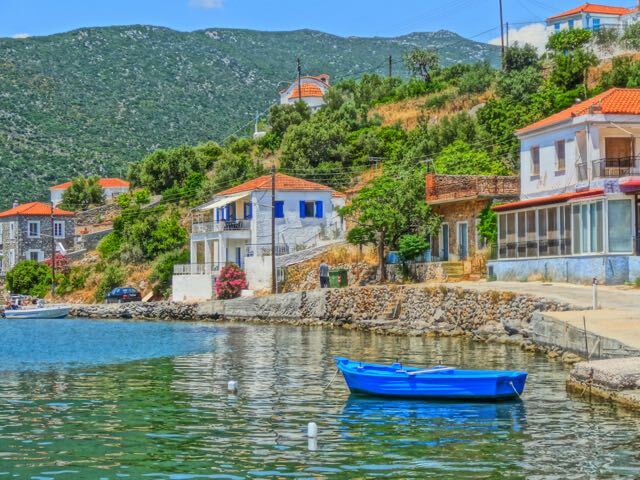 If you have a car you can go south to the island of Elafonisos for the kind of beaches that people dream about, or cut across the peninsula where there are a number of beaches on the western coast. 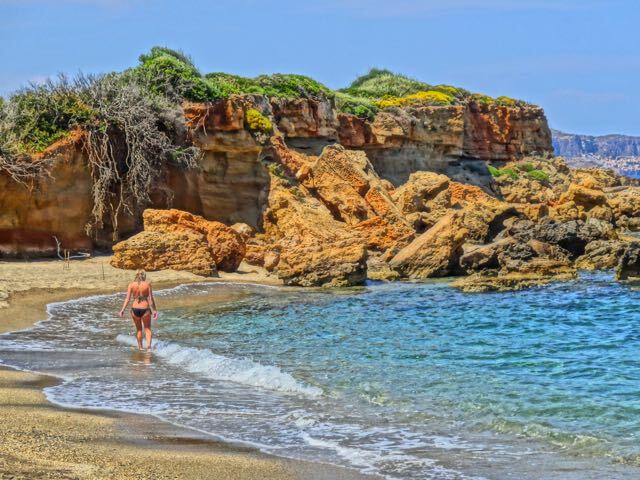 If you are adventurous drive north to Kyparissi where there are two spectacular stone beaches in a small town said to be the most beautiful in Greece. For trips from Athens see George the Famous Taxi Driver, but plan to stay overnight. The drive is around four and a half hours from Athens. You should probably plan on coming here by car or bus. There used to be a Flying Dolphin and a ferry but no longer. 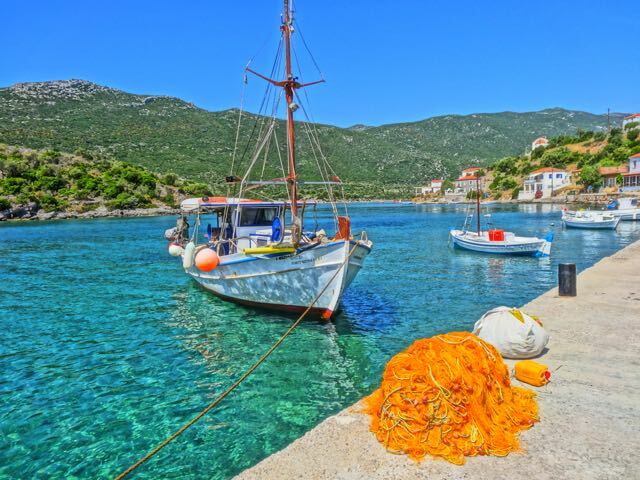 If you are a sailor, going down the east coast of the Peloponessos is a wonderful trip, eaqual to or better than any journey through the Cyclades. 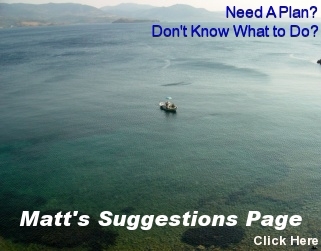 See My Sailing Pages for info on charters and skippers. To rent a car and drive from Athens to Monemvasia check out Swift Rent-a-Car . They will pick you up at the airport or your hotel and drive you to the National road and let you by-pass the notorious Athens traffic or deliver the car to you. You will probably want a car to explore the surrounding area and the nicer beaches are outside of town. 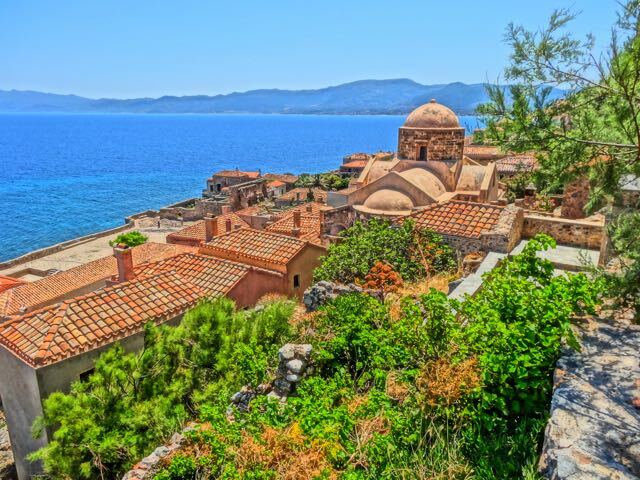 From Monemvasia you can easily reach Mystras, Githeon, the island of Elafonisos, the Diros Caves and the Mani on day trips. 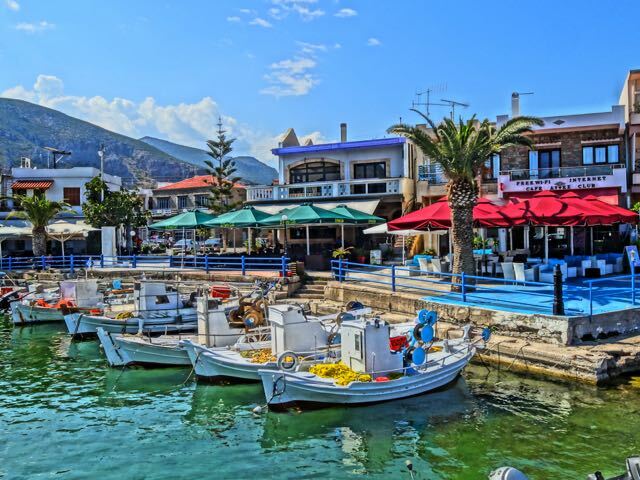 One nice excursion is to the small town of Gerakas (remember the original article) where there is a very nice fish taverna called Remezzos, owned by a Danish woman and her Greek husband, where many people from the area travel long distances on goat infested roads for a nice fish lunch or dinner in a lovely setting. If you don't have a car you will be pleased to know that there is a bus that goes from the causeway in the new town to the entrance of the fortress town that leaves every fifteen minutes or half an hour. (I asked and they told me but I forgot). 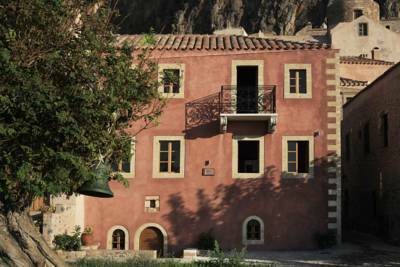 Here are a number of nice hotels in and around Monemvasia. 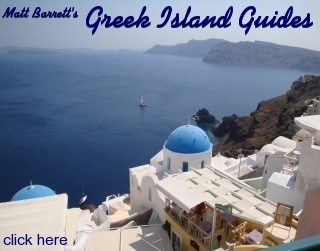 The hotels in the fortress town will be more expensive and the restaurants a little more upscale, but it is an authentic and unique experience and probably worth it in the same way that staying in the caldera in Santorini is. But if you are a beach person and your taste in food is more traditional and inexpensive then stay in the modern town across the causeway. 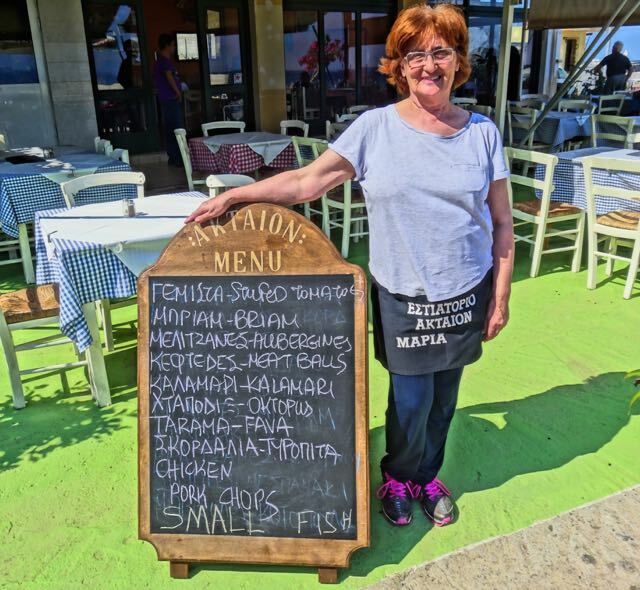 There is a very swim-able stone beach with a couple of fish tavernas, and there is a small harbor where there are some more. Getting to the sea for a swim from the fortress town is a bit of a chore. Anyway here are some suggested hotels. You can click on the name for more information, photos and booking. The small commission I make from your booking enables me to travel and write (and eat and drink). Ideally located inside Monemvasia Castle, Theophano Art Hotel offers accommodation with free Wi-Fi in a picturesque setting. Housed in 5 different stone buildings, the hotel enjoys views to the Myrtoan Sea from its rooftop terrace. Decorated with antique items and works of art, the air-conditioned rooms have marble floors and beamed ceilings. They are all equipped with LCD TV, fridge and APIVITA toiletries. Some rooms are facing towards Myrtoan Sea or the scenic village. Guests can enjoy a simple Greek breakfast prepared with local products. It is served at the spacious communal areas and at the main dining room of the hotel. 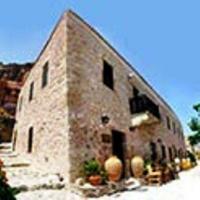 Theophano Art Hotel is located in the traditional settlement of Monemvasia, right on Chrysafitissa Square. The historical Portello, an opening in the defensive walls, and an ideal location for swimming are only 20 metres from the hotel. 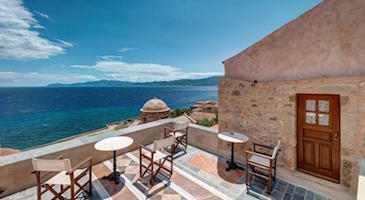 Boasting a privileged location, 300 metres from the gate of Monemvasia�s castle, Malvasia Traditional Hotel offers stone-built units most with views of the sea. A buffet breakfast is served at the breakfast room and terrace of the main building. The air-conditioned accommodation at Malvasia is traditionally decorated featuring arched walls and wooden furnishings. They open out to private or shared terraces and balconies and come with a satellite TV, mini fridge and free toiletries. Some units also include a kitchenette. In the castle of Monemvasia, you will find charming cafes, shops and taverns serving local specialities. Free Wi-Fi is available in the reception area and free parking is possible outside the castle alongside the road. The building has it's origins at the dawn of the 16th Century and the architects followed the traditional architecture of the area. It is considered the most impressive stone building of the Malvasia Castle-city. The hotel is ideal for romantic weekends. It is located at the nicest and most quiet area of the castle. The hotel offers the visitors hiqh-quality services, a family atmosphere and the warm, traditional Greek hospitality. The hotel offers rich, traditional breakfast with homemade jams and bread. This hotel is conveniently located on Monemvasia's bridge with a view of the castle, only 250 metres from the nearest beach and 300 metres from the centre of town. Offering ideal facilities for a comfortable and restful vacation, the hotel remains open throughout the year. Therefore, for whichever season you wish to choose for your visit, the staff will endeavour to ensure that it is special and unique. Set amidst tranquil natural grounds with the traditional streets in close proximity, this modern hotel blends contemporary comfort with the area�s historic heritage. 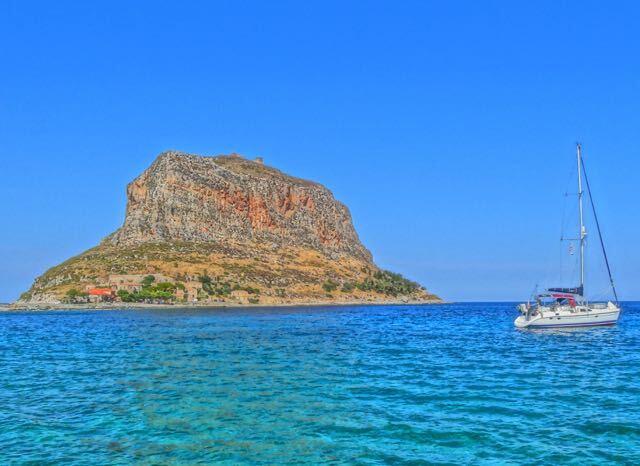 In the vicinity there is the medieval fortress of Monemvasia, providing plenty of opportunity to visit cultural attractions. All the comfortable and contemporary accommodation features a light interior and large balcony with a magnificent outlook of the castle and the open sea, the ideal base from which to explore this wonderful region. Wireless internet is available in public areas and is free of charge. Internet via modem is available in public areas and costs EUR 1.50 per hour. The hotel Akti Nefeli,built in a traditional style,is situated in the area of Xifias, just 5 kilometers from Monemvasia and overlooks the mountain and the sea. It is very well equipped, and can definately satisfy even the most demanding guests. The hotels' aesthetic and classical architecture, impress the traveller, while offering simultaneously all essential comfort in order to respond in all kinds of requirements. You will find us 30 meters away from the famous beach of Ambelakia. This beach (among all those of the area) offers splendid sand,crystal clear water and an astonishing view on Kastropolitea. We will be more than happy to welcome you to Akti Nefeli and we assure you that you will have a memorable stay. Wired internet is available in public areas and is free of charge. Annema Hotel is a quiet and friendly hotel offering the perfect opportunity for quiet outdoor relaxation by the coast of Monemvassia. The Annema Hotel provides a truly recreational alternative to the busier tourist locations of Greece. Presenting visitors with an idyllic natural silence and surroundings, this is just right for those who value nature and tranquillity. Located in the small village of Old Monemvassia, there are only 12 houses and one church offering a friendly rural atmosphere. Annema Hotel is newly renovated and provides customers with a pleasant restaurant and bar. You can also enjoy a dip in the private pool. 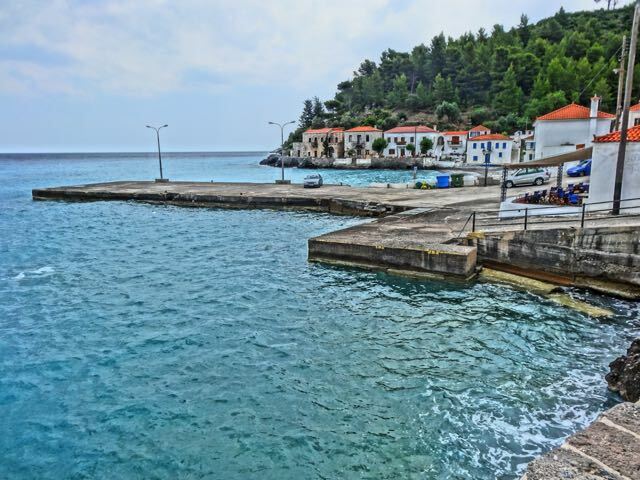 Roughly 300 metres from the hotel, there is a beautiful and often deserted beach, where you can enjoy swimming in both salt water and the freshwater springs that flow into the sea. Just by the hotel there is also a fisherman�s harbour with ideal facilities for private yachts and motor launches. Enjoy your holiday in a relaxed atmosphere, which leaves you with a memorable experience and refreshed mind. Wired internet is available in the hotel rooms and costs EUR 1.50 per hour. From the peace of your comfortable room enjoy breathtaking views of the sea and the castle. Our rented rooms in Monemvasia, named Glyfada Rooms, are located just 15 metres from the seashore and 1.5 km from the castle. 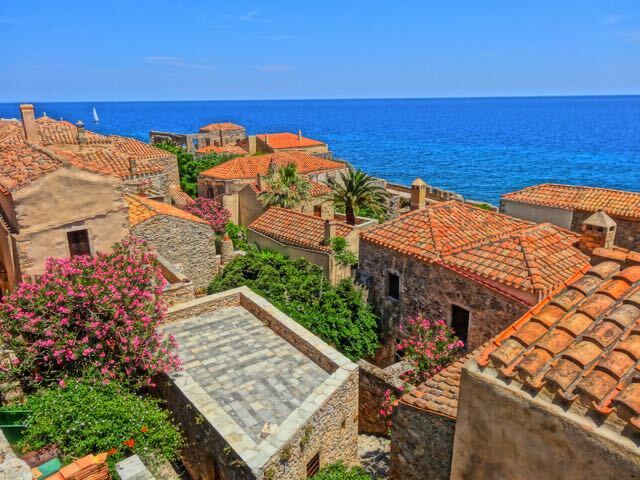 At the castle town of Monemvasia, you live in a dream. This is the place where time has stopped and the Middle Ages and the Byzantine era coexist with the present. As you stroll the narrow cobblestone pathways, gaze up at the stone 2-storey aristocratic residences and churches of the Byzantine era. After a day of exploring you can return to Glyfada rooms and relax with in drink in the privacy of your room. Sit on the balcony and soak in the beautiful evening views as the sea breeze touches your skin. Luxurious apartments, studios and rooms in the sought-after seaside area of Xifias - Monemvasia, and just 3 miles south of the famous Castle of Monemvasia, the so called 'Gibraltar of the Mediterranean'. Ideally located just 100 meters from the best beaches of the area. The Complex boasts a large swimming pool with hydromasage section for adults and a separate smaller one for children. The complex is located in a quiet and picturesque area and it is ideal for couples and families looking for something out of the ordinary from their vacations. Internet via modem is available in public areas and costs EUR 2.00 per hour. 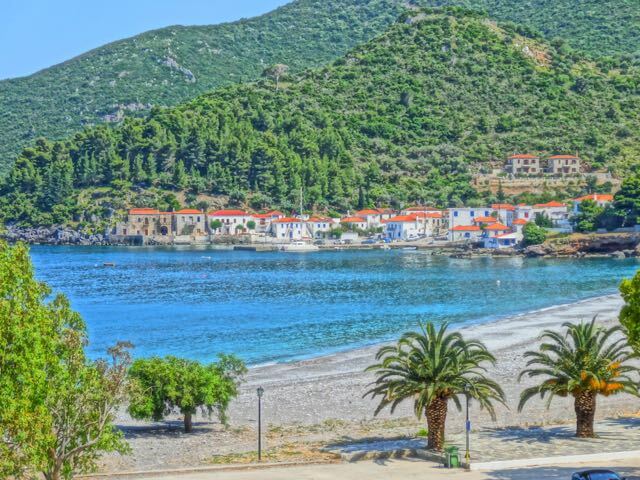 You can find hotels in Monemvasia by location, price, whether or not it has a swimming pool, and see photos and reviews by using this link to Booking.com. Excellent prices and many hotels you can book and then cancel with no cancellation fee. For those who want to book without using a travel agency this is the best way to do it. 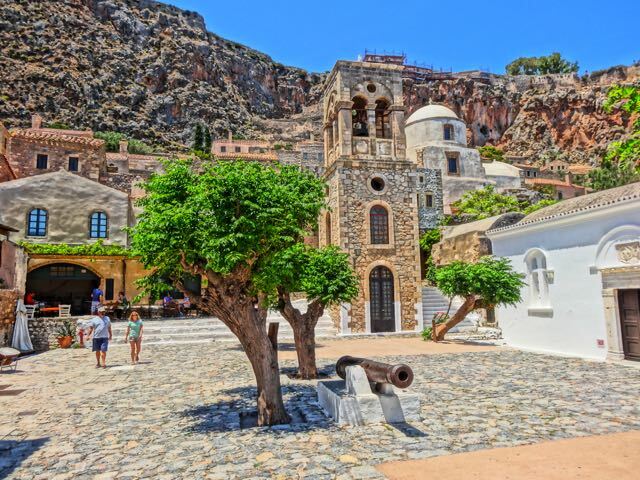 For those who plan to visit other areas in Greece along with Monemvasia it is a good idea to book with a reliable Greek travel agency to keep things coordinated and to have someone to turn to if there are unforeseen difficulties. You can see my suggested travel agencies or else try my Greece Create-an-itinerary form and get a quote with no requirement to book.